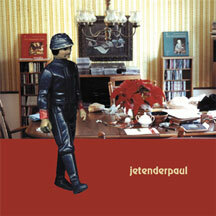 Jetenderpaul offer up the 6-song 7″ “A Casualty Too Serious Too Afford” as their smart follow-up to 2000’s critically acclaimed Jetenderpaul Presents the Modal Lines. The 7″ marks a bit of a return to long, obtuse song titling and short song segments, as well as an extension of the pop format established by their previous full-length. This 7″ is a co-release betwen Burnt Toast Vinyl and Hype City Record (Norway).